This look is a must try for Navaratri as it will give you a traditional look with a hint of western style. Dhoti pants are very much in trend and are very comfortable to carry. You can pair these with your lehenga blouse or any crop top. You can also accessories this look with a colourful dupatta & heavy earrings. Let’s face it! Navaratri & Ghagra Choli look go hand in hand every year. The Ghagra Choli look is one of the best Navaratri looks ever year! Ghagra Choli with beautiful silver jewelery will grab eyeballs and will fetch you many compliments. If you like experimenting with different style of kurtis, this is a must try look for you. Off-shoulder kurtis look trendy & fashionable compared to normal kurtis. So ditch those normal kurtis this Navaratri & try these off-shoulder kurti looks. Indo-Western jackets are very much in trend now a days. Jackets change your entire look & are also very comfortable & easy to wear. Indo-Western jackets are available in all sizes & various patterns. You can wear it with your jeans or trouser and accessories it with silver or bronze jewelery. 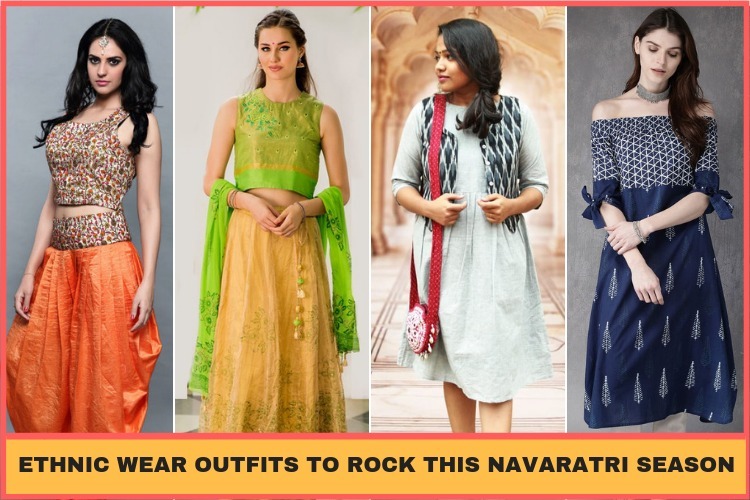 So stand out from the crowd this Navaratri by trying these outfit ideas & share your Navaratri look with us!